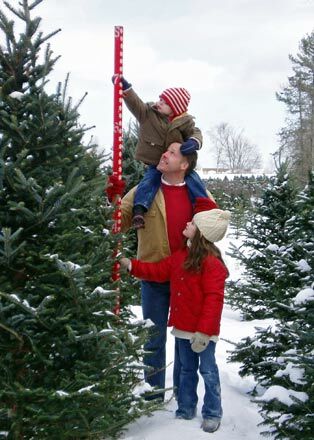 There's nothing like a family outing to a farm to pick out that perfect tree and bring it home for the holidays. New Hampshire has many Christmas tree farms that allow you to traipse through the trees, enjoying the scenery while you search for that one tree that say "take me home". You know you're getting the freshest tree possible along with a memorable adventure. Harvest-Your-Own is the fastest growing way to buy a tree. Some farms let you tag your tree ahead of time; you return during the holiday season and harvest it with a saw the farm provides - often a helper is there to assist you. Other farms allow you to tag your tree early and they will harvest it for you and have it waiting on the day of your choosing. Or you can just show up and choose and cut your tree in one easy operation. Many farms also have fresh, pre-cut trees available for your convenience. Wreaths, roping, and other holiday products can be purchased at the farm too. Sleigh rides, caroling, hot cider and doughnuts, and even Santa Claus himself can be part of the Harvest-Your-Own experience, so call one of the farms listed below and schedule your visit to a New Hampshire Christmas tree farm now!